By the time I’d searched for the dress pattern, bought it, as well as the fabric, sewed it and then dyed it, I realized that the ‘handmade’ cotton dress listing on Etsy was not so outrageously priced after all. When you hand make, it is slow, involved and takes time, and sometimes as you work, the idea, as well as the work changes. So of course for the truly handmade product, the price is justified even if at first it seems a little high. This experience with the handmade dress brings me to handmade felt and something which has been playing on my mind for some time. 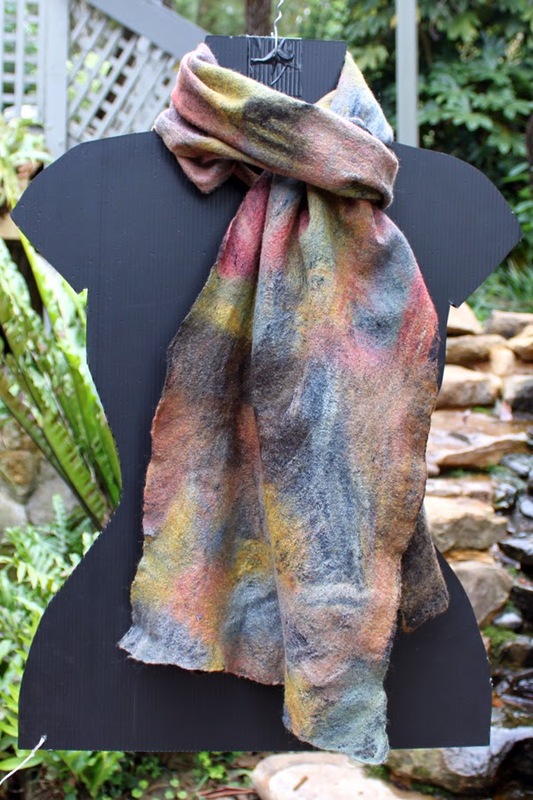 Dyed with eucalyptus leaves, onion skins and rust. This dress is made of cotton with silk used for the mandarin collar, front opening, sleeves and hem edges. I make slow felt, which is what makes my partner say that I’ll never make money, because I can’t produce it fast enough. He has come up with all sorts of ingenious ideas (on paper) to speed up my felt making – including an agitating table; and has been perplexed and frustrated when I haven't enthused over his ideas. Now if you speed up your felt in the dryer or washing machine don’t call it handmade, because I am the one who makes the handmade felt, and who needs to put in the hours on 50,000 rolls or whatever it takes to get a well-made felt cloth and garment. I recall throwing a beautiful worsted wool jumper into the washer on a non-wool wash cycle to save water and ending up with a matted shrunken ‘thing’ that wouldn’t even fit a doll. I wouldn’t pay for this machine matted process, and yet this is what some felt makers are doing and calling it ‘handmade’. What this accelerated process does is enable the producer to produce lots and at a lower price. Now given ‘handmade’ felt, which has not been hand made at all (but machine assisted felted) has a lower price, the consumer won’t know what makes my sort of slow felt priced twice or three times as much. I’m not suggesting that the maker stop throwing it in the dryer or washer – just don’t call it handmade. What is it about our society that promotes the fast – the fast food, the fast clothes, the fast buck, the fast car, the fast girl or boy, the fast path going to nowhere? Few of us appreciate the slow, the arduous, the deep and complex. Or could it be that I’m a person who likes to make it harder on herself? I cried when I ruined that jumper and I would cry to have to throw my felt into the washing machine. And I'm not going to. I'm able to feel all of the love and care that goes into the making of your beautiful felt creations. It always makes me feel good to know that you treasure me/our friendship enough to put all of the time that goes into the making of the pieces that you've given to me, and I so cherish them. It feels different....Not just the texture, though that, too, but also the knowing that you cared enough to spend the time that goes into their making. Thank you for your slow felt dear Joni...Your methods truly are a gift and you're a gift to me.